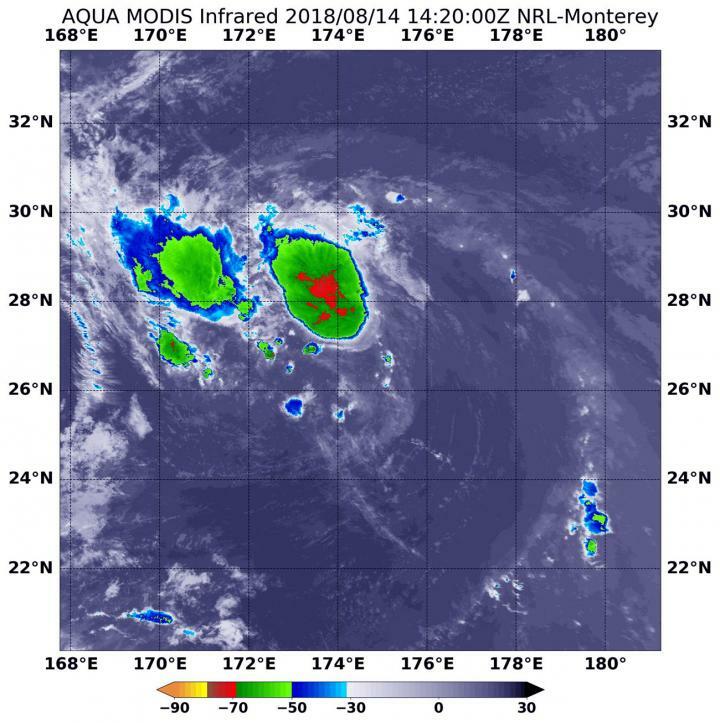 Infrared data from NASA's Aqua satellite provided forecasters with temperature data that showed the storm had two areas of strong convection. On Aug. 14 at 10:20 a.m. EDT (1420 UTC) the Moderate Resolution Imaging Spectroradiometer or MODIS instrument aboard NASA's Aqua satellite analyzed Tropical Storm Hector's cloud top temperatures in infrared light. MODIS found cloud top temperatures of strongest thunderstorms were as cold as or colder than minus 70 degrees Fahrenheit (minus 56.6 Celsius) around the center, and a second area northwest of center near minus 50 degrees Fahrenheit (minus 45.5. degrees Celsius). At 11 a.m. EDT (1500 UTC), the center of Tropical Storm Hector was located near latitude 26.9 degrees north and longitude 174.5 degrees east. That's 1,079 nautical miles northwest of the Johnston Island Atoll. The Joint Typhoon Warning Center or JTWC said Hector is moving toward the west-northwest. Maximum sustained winds are near 40 mph (35 knots/62 kph) with higher gusts. The JTWC expects Hector to veer to the north while gradually weakening. The storm will become extra-tropical by Aug. 16.